It is cold out there! Apparently the village of Odiham was the coldest place in England last night, a toe numbing -7.1c reported by The Odiham Oracle. It was a beautiful sunny morning though, and I couldn’t resist getting some rare Vitamin D with my youngest at the park. A little dog managed to give his owners the slip on a walk 2 weeks ago, and from various sightings “Bobby” is residing in the Old Basing area somewhere. Flo and I took a stroll round the village calling out for him, lead in hand. Fruitlessly we returned home empty handed other than a stick Flo found, to cozy in front of the fire with a mug of tea. Please keep an eye out for this little chap when you’re out and about, the owners are understandably concerned, especially as it has got so chilly. Only 9 days left of our new year sale! Quote, “New Year” when booking, to get a full set of lash extensions for £50, a full body Swedish massage for £35 or a Back, Shoulder and Neck for only £20. Our super LVL Lash service for £40 and a massive 15% off all Bio Sculpture gel nail treatments. In the hair salon we can offer you 15% off all highlighting services with Jade or Dani, a free luxury hair mask treatment, before any cutting service or if you’re free on Thursdays, Charlotte has blow-dry services on offer at just £10! Call us ASAP to book. 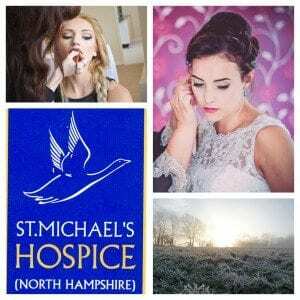 We are pleased to announce that St. Michael’s Hospice is our nominated charity to support in 2015, commencing with Mad Hair Day on February 14th! We are looking forward to getting to know our local hospice as well as its volunteers and staff, to learn what they do for our community as well as raising some funds for them. Dani and Laura, representing The Topiary, will take part in the St. Michael’s Hospice Basingstoke 5k Run, in May. If you would like to sponsor us by donating a little (or a lot) we would be most grateful via http://uk.virginmoneygiving.com/TeamTopiary. My hair gets crazy static in this weather. What am I doing wrong and how can I fix it? Static happens when your hair picks up an electrical charge from the dry air. It’s really common in the winter months because there is less moisture in the air. Overly cleansed hair tends to suffer more and you may find it useful to switch to a more hydrating shampoo and conditioner for your hair type. We have all been there, in Zara wrestling a top over our heads only to reveal a static mess that no amount of frantic patting will tame. Learn to love hair spray. It will be your hair’s best friend in these colder months, it will lock in moisture and prevent those fly way moments. Elnett by L’Oreal is a good one; it holds without giving your hair that typical sticky, hair sprayed feel. A great little cheat that I learnt a few years ago and have been telling my clients ever since… Tumble Dryer sheets. Keep one in your handbag for major emergencies. Just whip it out and wipe all over and under your hair. The static will disappear as if by magic and you can reuse the same sheet a few times too! Genius. At the salon our diary is getting busy for the wedding season, we are traveling out as far as Christchurch this year. We love doing wedding hair and being a part of someones special day, so now that we have Claire our fabulous makeup artist, to work with we feel that we can offer a complete bridal package. Wedding preparation, with waxing, nails, tanning and establishing a routine skin care regime and on the day, we can travel out or hold an in salon service, for hair and make up for all members of the bridal party. We have found that a lot of salons like to price “by quotation” and can leave brides feeling unsure when managing their budget. At The Topiary, we have a fixed rate for our wedding services, so our brides will always know from the 1st call to us, what we charge. If you are preparing for your wedding or assisting with one, then get in touch and see if we can be of service to you on your big day. What do you look for in a hair & beauty salon? We are constantly being kept on our toes by competitors, new trends, legislations here, there and everywhere and our own drive to strive. But where we really want to succeed, is client expectation! To keep you, our existing and awesome clients happy, we what to know… What do you look for in a hair & beauty salon? We would really appreciate your opinion as to where we can improve. Is there something that a previously visited salon did that we don’t? Have you a bright idea of your own? Are we missing the mark with something? Is there somewhere or something we can improve to make your experience better? Please FB message us or email us at hello@thetopiarysalon.co.uk. In return, we will email you a treat to redeem next time you visit us. So don’t hold back, tell us how we can up our game! If you like what we already do then if you could take a moment to follow this link to vote us as the best salon in Basingstoke! P.S We are like snowflakes. All different in our beautiful way.